Sande Bashaija & Lambert Rusoke, “Cash Crisis Hurts Chess ,” The Monitor, 3 January 2008 (Kampala, Uganda). There were some tremendous individual performances but financial hiccups continued to hinder the development of chess in 2007. The Uganda Chess Federation (UCF) was throughout the year rocked in a financial quagmire that saw national team players miss out on some major events that could have done much in improving the game’s image. Uganda was poised to send a team to the All Africa Games in Algiers, Algeria for the first time but a chronic shortage of finance was the country’s undoing. With the first quarter of the year gone, UCF had successfully organised four different tournaments and respective winners were selected to travel to Algeria. Arthur Ssegwanyi (National Junior Open), Bob Bibasa (Valentines Rapids), Shadraq Kantinti (Liberations Open) and Hassan Mulambe (East Africa Open) had emerged winners in the tournaments and UCF was optimistic about Uganda’s chances at the July All Africa Games. UCF Publicity secretary Vianney Luggya lamented back then, that it wasn’t only the four different winners that proved competition was on the increase, but in the way new and young players, unknown to the chess fraternity were upsetting the perennial stars. Players like Kenneth Ouma, Ssegwanyi, Joel Wegoye, Davis Agaba, Ivan Meri are just a few of those that defied the odds. “We tried our best to look for sponsorship but it was too late. It’s very hard to approach a sponsor on short notice and expect positive results,” said UCF General Secretary Godfrey Gali. The financial predicament continued to haunt UCF, with failure to raise numbers to honour the Individual Africa Championship invitational tournament in Namibia. In another twist, UCF failed to raise Shs30m to host the Africa Junior chess event and forfeited their rights to Malawi. Despite the financial troubles, there was some action on the chessboard that dominated the sports pages. 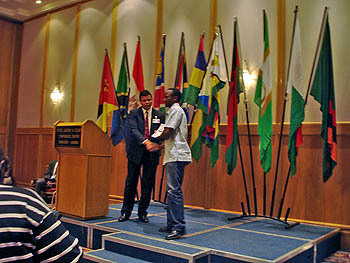 Uganda’s Steven Kawuma receiving his participation certificate. United Kingdom-based Steven Kawuma made the country proud with an impressive performance at the African Individual Chess Championships in Windhoek, Namibia. He put up strong performance in the very highly rated tournament featuring the continent’s top players, earning the FIDE Master (FM) title. FM is a prestigious title that precedes the International Master (IM) and later GM (Grandmaster). There are many benefits associated with being a titled player. IMs for instance make a living by playing in invitational tournaments world over. They are given appearance fees on top of getting fully paid trips. Kawuma then followed this up with a splendid display to become the Hampshire County chess king in November. Kenneth Ouma came to the spotlight during the Liberations Open in January, where he came second to Shadraq Kantinti. It was his performances herein, dispatching perennial national stars like Moses Kawuma and Bob Bibasa that lured the sports scribes to vote him the sports personality for January and proved along the year, that it wasn’t a fluke. Luzira Chess Club won their maiden national league title, dethroning Mulago Kings in what was a two horse race from the start. Busoga College, Mwiri also outmaneuvered 2006 winners Namilyango College at the Fr Grimes Schools’ Championship. Should the few stars improve on last year’s performances on the board, 2008 will be a year to behold. African Chess is in trouble. Uganda’s problems are well-stated above; Kenya’s political climate is well-known and will no doubt impact Kenyan chess; Botswana is in a tremendous turmoil and Nigeria is still trying to take off. Zambia seems to be in shambles given their poor efforts to accommodate their native son, Amon Simutowe during his GM quest. Zimbabwe is struggling because of the the political pressure, but at least IM Robert Gwaze is playing once again. South Africa shows signs of life. Of course Egypt continues to ascend and is the only country making tangible progress. Africa is a large, diverse continent but the problems in the chess world persist. Where are the answers? I doubt Chess can rise ,Problem is ,if Chess commanded a lot of Sponsorship then tournaments would be flooded ,why? ?because you only need a board its the sort of game any obese chancer thinks he has a chance of making money whilst avoiding sweat .I know many many who quit because there is no money .I would hate to see them back because tournaments would simply be flooded .The world is in a balance in a crazy way .e.g a country like Britain or USA does not produce oil ,so what to do? ?of course steal and kill for it in Iraq ,Afghanistan etc or no survival .For example in Europe they have the “brains” whilst in Africa they have the “resources”.tell me how a country like Britain that produces next to nothing with no natural resource survives or is thought to be rich? ?of course stealing and fake democracy.I am trying to make you understand Chess has to stay that way ,otherwise its chaos.It has to be a poor game to ward off interest or risk our so called masters hammered by people they never thought existed.To me Chess is crazy enough as it is ,with 6 yr olds competing against 50 year olds for same prizes ,so imagine the game was rich…..its like economics man ,Money has to be scarce not to lose its value ..Chess sponsorship has to struggle a lot for the game to keep its dignity(attracting a few)or at least keep going.